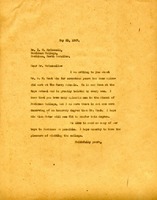 Martha Berry sends a letter of appreciation for the donation sent to her. S.H. 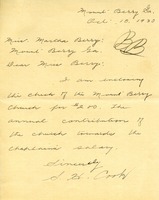 Cook sends a check of $200 for the Mount Berry Church to cover the chaplain's salary. 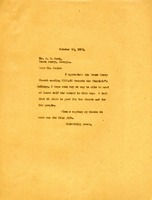 Letter to Mr. I.M. McConnell from Martha Berry on behalf of Mr. S. H. Cook, an alumni of Davidson College. Miss Berry informs Mr. McConnell that Mr. Cook has been working at the Boys School for 17 years and that he is beloved by everyone there. Miss Berry compliments Davidson in saying that many of the alumni of Davidson are splendid but she does stress that none of them could be as deserving of an honorary degree as Mr. Cook. She asks that they award him with this degree, while also informing Mr. McConnell that she wishes to send as many Berry students to Davidson as possible. She also wishes that one day she might visit Davidson College.